Creating a fence for your property helps provide safety and security. A corrugated iron fence provides both because it is strong and solid, leaving no cracks for entering or viewing personal property. 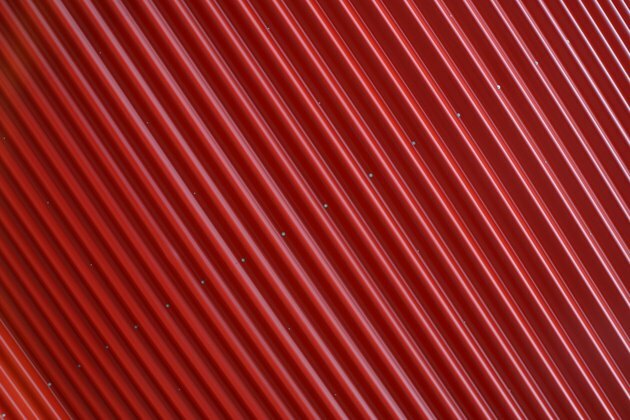 The iron is corrugated when it has alternating ridges and grooves. This product is available in 10-foot rolls at some home improvement stores. The posts to hold the fence are available in iron, steel or wood, depending upon your aesthetic needs. Use metal paint to add style to your fence. Measure the space where the fence will be erected with a chalk rope tape measure. Snap the chalk rope to leave a chalk mark where you want the fence. Divide the measurement by 10 to determine the number of rolls of corrugated iron fencing you need to purchase. Divide the measurement by 3 to determine the number of posts you need to purchase. Place a marker flag every 3 feet along the chalk line, starting at the first inch of the line. Hammer in a 7-foot steel fence post to replace each marker flag by hitting the top of the post with a ball-peen hammer until the fins on the bottom -- which mark 1 foot -- have entered the ground. Attach the rolls of corrugated iron fencing to the steel posts by riveting the edge of the first roll to the first post with 1-inch rivets in each of the four holes on the posts using a rivet gun. Continue installing the corrugated iron fencing to the posts until the entire fence is in place. Cut any fencing at the last post it passes; do not let fencing extend midway between posts. Begin the next roll of corrugated iron at the post where the last roll ended. Punch the four rivets through both sheets of iron where fencing overlaps.